Media News Releases | LiquidChefs ‘breaks the ice’ in the Antarctic! 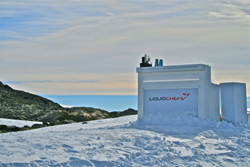 LiquidChefs has celebrated another first, taking the concept of premium mobile bars to another level: On 23 November 2009, LiquidChefs set up a 1.5 metre, fully-equipped evolution bar on the ice in Antarctica, to welcome the first-ever commercial flight to land in the Antarctic. 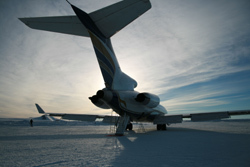 White Desert is the only company in the world that can take guests into the interior of Antarctica in luxury and style, using private jets. 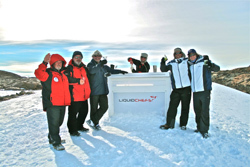 LiquidChefs was chosen to add to this luxurious experience, by serving cocktails on ice to all guests upon their arrival and during the course of the first ever day-trip to Antarctica. “It is a landscape unlike anywhere else on the planet, so rarely visited and as beautiful as it is surreal. Seeing a LiquidChefs bar on the ice in Antarctica was definitely one of the most magical moments I have ever experienced!” said Shai Evian, LiquidChefs Director. Guests were clearly astonished to see one of their favourite local entertainment brands standing proudly on the ice, awaiting their arrival with freshly-made Martini Zens, Mojitos, Caipiroscas and passion fruit Margaritas.